It’s lunch time and the line at the cash register keeps growing longer at the Los Hermanos minimarket. School teachers, construction workers and residents from nearby public housing all crowd in for fresh vegetables and meat to cook at home, or for prepared meals like fish or pork with broccoli, peppers, sweet potatoes, cauliflower and rice. Nadine Ramsey, 59, a teacher, walks to the fruit shelf to decide between pineapples, mangos and watermelons for dessert rather than sweets. Ramseys’ choice would have been impossible two years ago. At that time, Los Hermanos bodega, at 501 Jackson Ave., offered a meager selection of fruits and vegetables. Now, the store sells more than 30 varieties of fruits and veggies, thanks to an initiative to increase the amount of healthy food available at bodegas across the Bronx. “I come here because it is very healthy,” says Ramsey, 59, who teaches special-needs students at J.M. Rapport School, and eventually decided on the mangos for dessert. “They have what you need to complete your diet every day.” Ramsey has been a customer since Los Hermanos started stocking healthier foods two years ago, as part of the Healthy Bodegas Initiative. 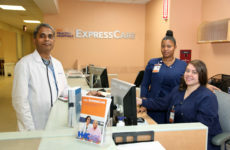 The three nonprofit organizations that first collaborated with the city’s health department to create the program two years ago– Bronx Health Reach, BronxWorks and Montefiore Health System — are now working with several other organizations on a new marketing campaign aimed at promoting the healthy foods the bodegas are selling. The Bronx Bodega Partners Workgroup, as the new coalition calls itself, recently launched “Don’t stress, eat fresh,” with the objective of encouraging Bronxites to eat salads, yogurt and other nutritious food, with ads that say, for example “Live Longer, Be Stronger”, and social media ads, shirts, caps, and events. The coalition’s goal all along has been to fight two familiar scourges in the neighborhood, obesity and diabetes. 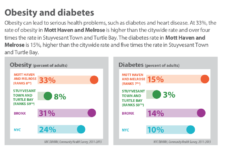 According to health department data from 2015, Mott Haven and Melrose had more obese residents than any other neighborhood in the city, with 33 percent, compared with 24% citywide.The local diabetes rate was 15% that year, compared with the citywide average of 10%, according to the DOH. 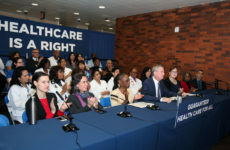 Sean Lucan, a professor at Albert Einstein College of Medicine who has researched the availability of food in the Bronx, says that there Bronxites actually have more food available to them per capita than Manhattan residents, but cautions that that statistic is misleading. “Most of that food is the least healthful option you can think about, like candy, cookies, chips, soda,” said Lucan. 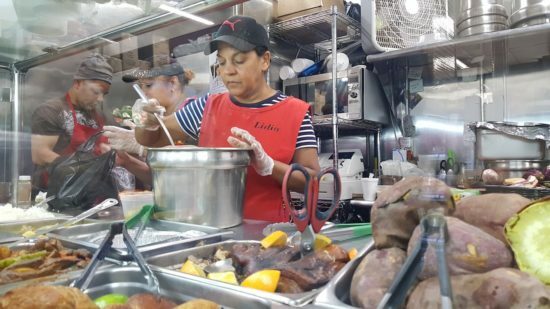 At Los Hermanos, the decision to increase the variety of fruits and veggies has led to an increase in sales of about 50%, said Lidia Gomez, 58, who along with her husband Ramon Gomez, has owned the store for more than 20 years. The Healthy Bodegas program provided them with a large refrigerator for the increased amount of produce, as well as more shelves and a smaller fridge for salads and bottled water. The Gomez’s say that their decision to add salads to their stock is the direct result of customer demand. Eighty-five percent of their customers use food stamps. Not all of the bodegas participating in the program will meet the goal of selling such a diverse array of food, due to space constraints and competition from big supermarkets, says Elizabeth Spurrell-Huss, Senior Project Manager of Public Health at Montefiore Hospital, but the bodegas are carving out a niche by making healthy food more visible. In addition, she says that the ad campaign will help them compete against corporate interests, whose ads for sugary food and drinks are everywhere. While waiting for a bus on 138th Street, local resident Nataly Anderson, sat eating bread and butter.